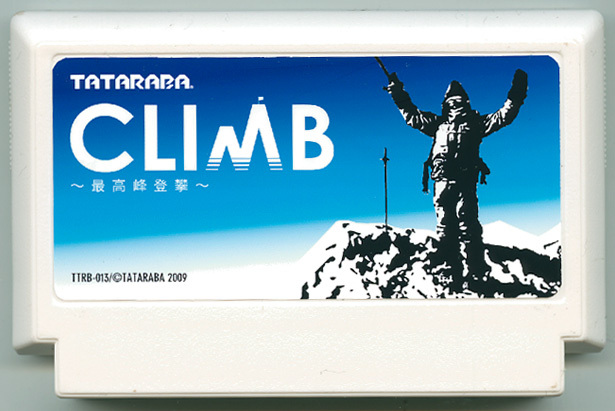 Mt., (formerly 'Climb, and then 'CrampON') is a simple game about climbing big procedurally generated mountains. The shape of the mountain is based on the name of the mountain that you enter, so favourites can be climbed again. The jump and rope mechanics are a little bit unique too. There's more about the game and its development here. Some of the mountains really don't make sense, but it is still quite good! "Mt. [three letter component OR St. ][three letter component] [three letter component] [three letter component]"
The nonsensical mountains are a feature, not a bug. I promise. Figured its much better to have wacky mountains with loads of cool overhangs than 'realistic' mountains. Name generator is a great idea. But maybe I'll switch it on its head and the name will be the seed for the random generator, so you can say "I'll have a go a climbing mt so-and-so today" and it'll be the same each time. Will the player be able to place anchors for his rope as he's climbing, in case he falls or will it just be a "fall to your death unless you can catch the side of the mountain with your picks" sort of deal? Wasn't planning on anchors, although I have thought about it today after watching youtube videos of climbers falling. Could have anchors as pickups or something. However, having toyed with an alternative to the existing gameplay today I think I've had a change of heart. Instead of a clickfest of placing axe after axe, the new mechanic has you jumping and swinging your way up the cliffs; its much more fun. I'll try and post up a demo of it later. It also looks better. Screenshot of the newest prototype. As I said above, there's more jumping. Less clicking. Was thinking of changing the name of the game to 'crampON', because the game now features a heavy emphasis on sticking to floors and cliffs by your feet. Basically, you jump around sticking to surfaces. BUT you can only stick to a surface by your feet so whilst flying through the air you have to spin around until you're orientated right. Otherwise you just bounce off and sustain some injuries as you tumble down the mountain. Next to come is ropes and swinging, so that its actually possible to get all the way up. Interesting abstraction of the mechanics. It takes some getting used to, and often it seems the character bounces off the mountain when he's not even touching it (except by the feet) so maybe you should make the collision a bit more lenient in that regard. Yeah, I can't get very far on vertical walls. I'll need more tools for that. Yeah, going to have to play around with the collision (again) tomorrow to tighten it up a bit. When I add a rope tool, scaling the mountain should be made a bit easier, and cooler. Hopefully not too easy. The new version looks awesome! I really like the minimalistic style. Glad you like the way it looks. I like it too. Ropes - or more accurately, bunjie cords - are now IN! You can now navigate tricky overhangs by swinging and bouncing on the ropes. Still not easy to climb the mountains, but its not supposed to be. How do bungie cords work? I only figured out how to jump haha. Was having an awesome time though, this is really fun once you get the hang of it. Very cool game! It takes a bit to learn to use the jumping rope, but when you learn to use it, nobody can't stop you! If you're having trouble with the controls have a quick run on 'Mt. Tutorial'. Should give you enough pointers to get by. The controls are a bit tough to begin with. This is a SUPERB adventure. I really like it! Even though it really isn't like climbing at all, the way you have to go up it and how you when you fall, you spin wildly, and attempt to land somewhere... it really feels like a climb! I love the idea/mechanics of this, but it is quite hard for me. I think I have the jumping down, but can never get past any precipices - I have yet to master the rope, I suppose. Yeah, the rope is my worst skill too.